It will come as no surprise to readers of this blog to hear that the Office for National Statistics is heavily involved with working in and around large amounts of data, which is why we are proud to once again sponsor Open Data Camp. As we get ready for the trip to Aberdeen, ONS Chief Publishing Officer Andrew Dudfield, explains how ONS Digital are working to make more data more open. The organisation is, in part, formed around a large data production process. We initially collect information. This has been traditionally collected via surveys filled in by individuals and business and is over time being augmented via a wider range of other data sources that help us better understand the world we are measuring. Once we have the data, we need to store and process it. Again, this is an area of immense change. Not so long back, this would be in processing paper forms so that we could apply statistical methods to the results. We are now utilising a wide range of large scale data storage solutions to ensure the widest range of well organised, well labelled, consistent data is available to our teams of experts to work with and offering them a wider range of technical tools than ever before to unlock the insight within this. That insight is, in part, what is then published as statistics. The publishing of these statistics is also transforming. We are trying to move from a world of inconsistent excel documents published on the pages of our website, to forming an openly available layer of data that anyone can easily access and use to answer a wide range of questions. Within that, the word ‘open’ is important. We want to publish data that is open for as many people as possible to use. The use cases for this are near endless, but could include automated fact checking of statements, using the data to augment the responses given via voice controlled interfaces, producing automatically updating charts containing the latest data we publish and so on and so on. We have started this journey by producing some Beta functionality on our website and via a new API. These are the thin edge of a much wider project and one we want to evolve in line with the needs of the users of this information. This, in part, is why I and a handful of my colleagues are heading to Aberdeen in November to attend the 6th Open Data Camp. This unconference has been touring the UK for the last few years, drawing together a group of likeminded folks who are interested in the importance and utility of the kind of open information the ONS is producing. We have sponsored the conference on several occasions and are pleased to do so again as we believe those attending and the communities of practice they represent are a vital audience in helping us deliver the best digital and data services possible. Open data has proven time and time again to be one of our most precious sources of information and insight that has largely been untapped. But why is this so? It has come about for several reasons, largely lying with individuals not knowing its availability, the difficulty in accessing it and sometimes even the impossibility! Raising awareness of its opportunity and the processes it can be used for is something that must be done in communities all over the world to gain advantage of this useful commodity. Open data, especially relating to government issues, can provide great insights into society and culture. With the creativity in the world today and the vast knowledge, interest and experience individuals have, releasing data can prove beneficial when in the right hands. Many questions that understaffed departments in councils have, could be answered by someone with an interest in testing their data skills using an open data set at home. Working together can bring about many unforeseen benefits if we all seek a common goal of making products and services better for everyone. The Data Lab is an innovation centre set up by the Scottish Government to help Scottish businesses seize the growing opportunity that is data science. The Data Lab carries out a wide range of activities. It’s three main focuses are in collaborative innovation, skills and talent, and community building. Collaborative innovation involves setting up projects with companies or public sector organisations in collaboration with Scottish universities which will add financial and social value to the Scottish ecosystem. These projects are wide ranging and can be viewed on our website here. One example of an open data project we worked on in the past is openSIMD(Scottish Index of Multiple Depravation). openSIMD makes the calculation steps between the indicator data and the final SIMD measure completely transparent and open to scrutiny – no black box any more. It is a bit of R code along with documentation and data, which lets you calculate SIMD16 for yourself while making any changes you want. More details here. Our skills and talent focus is on creating the next wave of data scientists. We fund over 100 MSc students each year, and several PhD students also. Along with this we carry out executive education courses and MOOCs. For more info on any of these please click here. Our community building focus is all about creating an ecosystem of interconnected data scientists in Scotland. This involves meetups, workshops and our annual festival of data innovation in March, DataFest. During DataFest this year we are hosting Scotland’s first technical data science conference, DataTech, which will shine a light on data innovation with a focus on the back end. If you want to get involved and even submit your own speaker proposal (perhaps around open data!) more info can be found here. As part of our wider community building strategy we support external events who promote data and the culture surrounding it. For this reason, we could not say no to sponsoring an event as progressive as Open Data Camp. It’s promotion of open data is critical in creating a transparent society where we as citizens could potentially have a greater impact on our locale, for example with the release of traffic data, figuring out how to maximise the use of public transport at peak times. Through its very intriguing unconference style blueprint, it will make you rethink how open data is used and how you can use it more often and to a greater shared benefit. Along with this it offers a unique opportunity to meet with like-minded individuals to share ideas, make new pals or even start some personal projects together! The true power of this event is in the people it brings together. With you the event is a lot stronger than without you. One of the core ideologies around the unconference style is that the people who come are the best people that could have come. You get to make it as engaging and productive as you want it to be. Unfortunately tickets have all sold out, but there may be some cancellations nearer the day. Be sure to take this opportunity to get involved in an event that not all cities have the chance of hosting. The team in Aberdeen are doing fantastic work in raising the profile of open data. Showing your interest through involvement is a great way for them to know that their hard work is paying off and paving an exciting path for the future. We’re delighted to be sponsoring Open Data Camp Aberdeen and look forward to a really exciting few days working with open data! DCMS – the Department for Digital, Culture, Media and Sports – is proud to sponsor the 6th Open Data Camp in Aberdeen this year. But why is the department responsible for culture sponsoring a data conference? Well, since taking on responsibility for data policy and governance earlier this year, it has been all-go on the data front! The department has announced the commencement of work on a National Data Strategy, and continued the work started at Government Digital Service on areas such as data ethics and open government… not to mention the development and governance of policy around how government collects, shares, uses and protects data. And this is before we even get to the creation of the Office for AI, and Consultation on the Centre for Data Ethics and Innovation. It is all further evidence of how DCMS is leading government’s thinking on the use of data not only within the public sector, but in the wider economy as well. The National Data Strategy has been asked to ‘unlock the power of data in the UK economy and government’ – what do you think this should mean?! We look forward to refreshing old friendships and developing new ones… and maybe some visual thinking from the kind folks @drawnalism! Food Standards Agency supporting Open Data Camp again! The Food Standards Agency is delighted to be sponsoring Open Data Camp 5 in Belfast. Particularly as it is home to some of our staff and one of our offices. And in the Open Data world of food, Northern Ireland is pretty special – it is the second country to mandate display of FHRS ratings for food premises. So, if you are joining us in Belfast be sure to look out for eateries with a high score! Of course, the catering provider for the event has an FHRS of 5! Wouldn’t want anything other than ‘Good’ for our attendees. Finally, FSA staff attending look forward to seeing many of you in Belfast. We are really looking forward to an Open Data focussed weekend with like-minded people. Look out for us throughout the event. Siân, John and Naomi. The Northern Ireland Statistics and Research Agency are pleased to be sponsoring the Open Data Camp NI promoting the use and re-use of government statistical data. The Northern Ireland Neighbourhood Information Service (NINIS) is one function of the Northern Ireland Statistics and Research Agency (NISRA), an Agency of the Department of Finance. The aim of NINIS is to make small area information held within Central Government and Non-Departmental Public Bodies available to as wide an audience as possible. The NINIS website contains over 2,600 datasets on a range of socio-economic themes at small-area statistical geographies; area profiles that provide statistical snapshots of an area and interactive maps that enable statistics to be interpreted readily in a spatial context. All datasets are accompanied by standardised metadata with contact details for the data supplier. 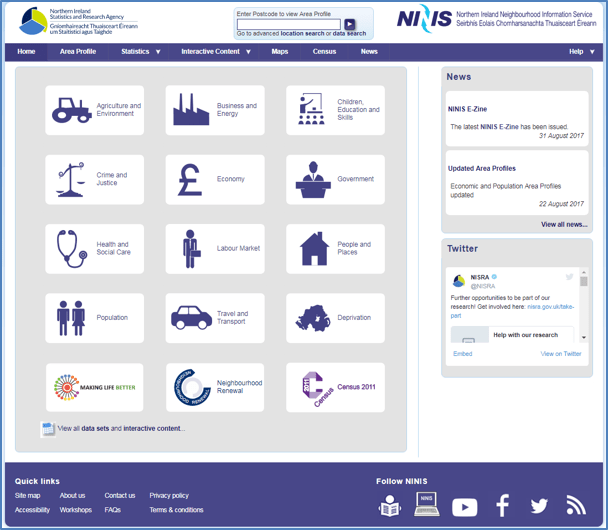 The NINIS data portal (www.nisra.gov.uk/ninis), which has been around since 2003, is one part of NINIS. We also provide advice on understanding small area statistics on an ad-hoc basis through the NISRA customer line and email, and through NINIS monthly seminars. NISRA is committed to increasing the amount of data released in open and re-usable formats in the production of its statistical outputs and NINIS is key to progressing this Open Data Agenda with data being free to download in Open Document Spreadsheet (ODS) format. The NINIS website has had on average over 10,000 visits each month. Users can keep up to date with NINIS by subscribing to the NINIS E-zine or by following NISRA on twitter (@NISRA). 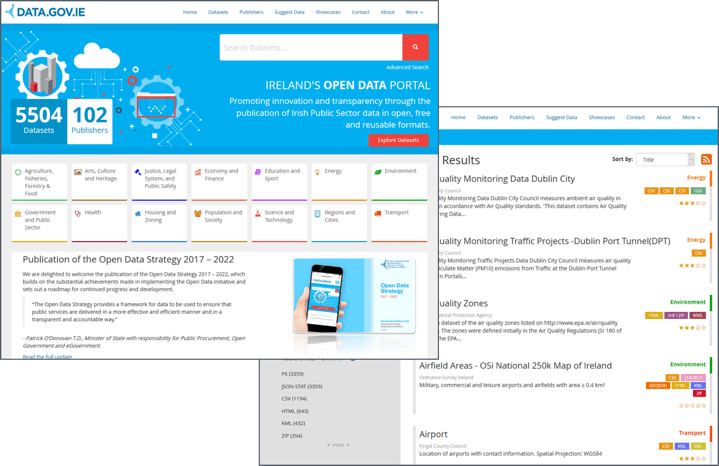 Ireland has been highlighted as an Open Data Leader in Europe, ranking 3rd in a European Open Data Maturity Study on Open Data readiness, maturity, impact and policy. An impressive outcome considering that the Irish National Open Data Portal is relatively new. 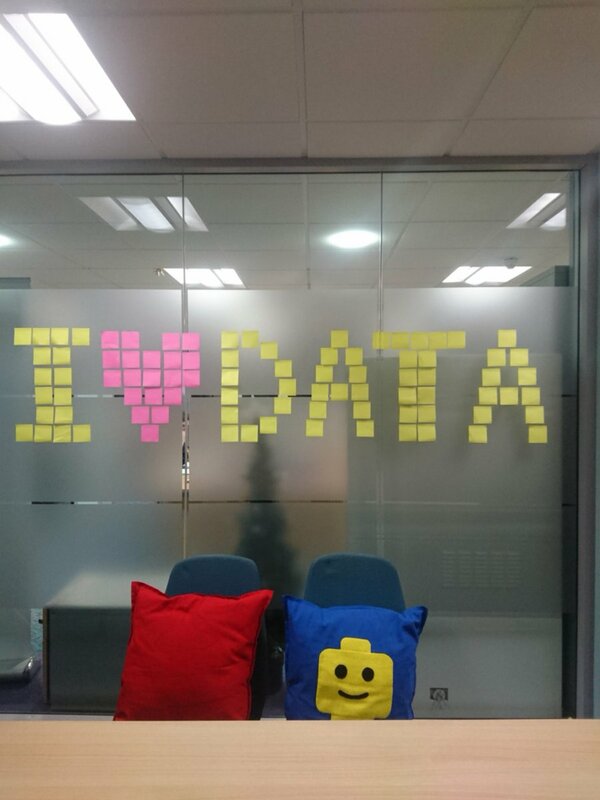 Officially launched in 2014 by the Department of Public Expenditure and Reform, data.gov.ie has grown from 450 datasets to over 5,500 datasets, and has ~7,500 monthly visitors. Derilinx has supported data.gov.ie since its launch, and in that time, we have seen more and more Public-Sector Bodies engage with the Open Data Initiative. Originally, the focus of the Initiative was on making data available – Raw Data Now – release the data quickly, even if it is a bit messy. Users were mainly categorised as citizens, looking for more information about public sector services, or developers, building apps on top of datasets. As Open Data Initiatives mature, so too does the way that Open Data is being used and can have an impact. Today, we see that there are multiple beneficiaries of Open Data release; from individuals using Open Data as a core element of their work (e.g. citizens, journalists, students), to research institutions and civil-society organisations that want to carry out and give context to studies; and from SMEs that are incorporating Open Data as a key ingredient in their business models, to MNCs that are utilising Open Data in their analysis and decision-making. Open Data Impact is one of the most important aspects of an Open Data ecosystem, but often one of the biggest unknowns. That is why Derilinx decided to launch the Open Data Impact Series – to promote awareness, adoption and use of Open Data in different sectors, and support the publication of high-quality Open Data. Our inaugural session ‘ Creating Business Opportunities with Open Data’ took place on 26th Sept 2017 and focused on how Open Data is a valuable resource for businesses, which can be used to build new applications, enhance existing products or provide additional context for decision making. You can read the outcomes of our event here. On the one hand, we all want to get our hands on as much Open Data as possible asap. On the other, putting in place automated publication processes for up-to-date, high-quality datasets takes time and effort. Should the publication of certain datasets be prioritised by Public Bodies, and if so, how can this prioritisation take place? Everyone is interested in knowing the impact of Open Data reuse. However, because access to Open Data is anonymous, how can we identify and measure the direct and indirect outcomes of Open Data publication? While publishing datasets one at a time is good start for Open Data publishing, how can Public Bodies be encouraged to embed Open Data publication into their overall data management strategy, so that they are truly Open by Default. Different organisations collect, manage and process a wide variety of datasets, which can then be published as Open Data. The value of Open Data is often derived when it is consumed with data from different sources. However, such integration requires that data is interoperable; otherwise a large amount of effort is spent on data cleaning. How can the use of standards be promoted to facilitate data interoperability? As a regular participant at ODCamps, Derilinx is delighted to sponsor ODCamp5 in Belfast! Belfast Open Data Camp: how are YOU getting value out of data? This is completely something we are keen to continue talking and hearing about at OD Camp 5 in a few weeks’ time. Like Paddington Bear, Jamie and I will be packing our marmalade sandwiches to travel across the sea. 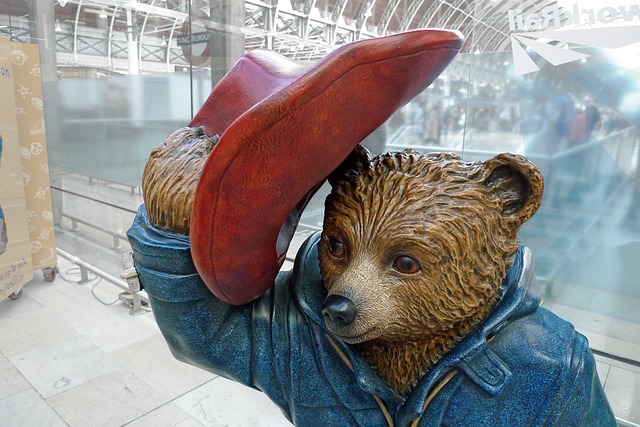 Unlike Paddington, we’re doing it because we’re keen to hear about what problems people are solving with data and what the different approaches to solving those problems are. Who’s collecting the data? Who’s communicating the analysis to those people making decisions? Who, what, when, where, why? It’s going to be all kinds of good — look forward to seeing you there! Swirrl are sponsors of Open Data Camp 5, which is coming to Belfast on 21st October and have been sponsors of Open Data Camp since it first sprouted its wings in February 2015. In October this year a group of like-minded folks will be meeting at Queen’s University in Belfast to chat about open data. They will be doing so under the banner of Open Data Camp, an unconference for those interested in making information from a wide range of sources “open”. For those unfamiliar with the concept of an unconference, it is a format based more around peer-to-peer learning, creativity and collaboration. In the context of this unconference, open can mean many things. In the depths of the technicalities of machine readable serialisation, the legality of data reuse, or how to convince your boss that making information available in only PDFs tends to be, shall we say, sub-optimal. The reason I am writing this post here on @onsdigital is because I am pleased to say we are sponsoring Open Data Camp. We get asked to be involved in a lot of different conferences, but are not able to say yes to many, so I wanted to write a little about why this one is important to us and what we hope to gain from the weekend. Primarily, we do this because we care about this community hugely and want to help ensure events like this can be financially viable. We also do it because ONS data being open is important if we are to ensure the greatest possible social and economic benefits for the public. I’ve written about some of this over in my own blog, but don’t take my word for it, listen to Sir Tim during his Ted talk . “What you find if you deal with people in government departments is that they hug their database, hold it really close, so that they can build a beautiful website to present it. I still regard this as pretty much the most important statement anyone has made about what the digital relationship between the citizen and the state is and what it could be. Here at ONS we have been thinking about this a lot, have done some things that hopefully start us in the right direction for opening things up and know we have an awful lot more ground to cover. We started with defining (with the help of Leigh Dodds) some open data publishing principles. I am hoping to pitch a session at open data camp around how we can make the data we publish through this system as open as possible and as useful for our users as we can make it. A few final tickets for the event are going to be made available soon (it is free to attend) and I look forward to having some interesting conversations with those of you I get to meet over the weekend. If you are unable to attend, but are interested in offering feedback on the work we are doing around open data at ONS, please get in touch with me directly, or register your interest to take part in the user research we are undertaking. We have upcoming sessions in London, Sheffield and Liverpool.